Everybody is raving about kale. It’s a must-have super food and I’ve seen so many requests from people asking for suggestions and ideas on what to do with it. An obvious choice for kale is a soup, where the earthiness of kale and it’s sturdy structure add an interesting bite to it. Many also recommend using kale in smoothies, which I am not really all that interested in doing. Another obvious choice is to use kale in salads. Unfortunately, kale is really sturdy and the only option you have for using it in salads is to go with baby kale. 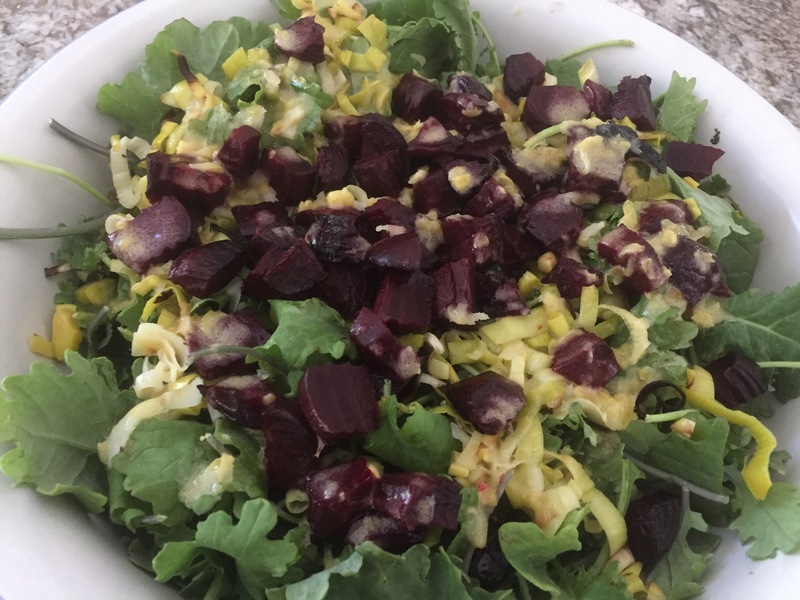 I used baby kale in the past, like in this salad full of great flavors of roasted beets, leeks, baby kale, and lemon vinaigrette. But, recently I started playing around with ways to make kale work in a salad form, and discovered that the best way to do it is to sauté the kale to soften it. Also important is to remove all the big stems first – they are tough and chewy, so best removed before cooking. This makes the prepping process a bit tedious – you need to take a bunch of kale, wash it, remove the stems, and chop it – and very often I don’t really feel like doing it. You can buy chopped kale these days; however, most brands don’t do a great job at removing the pesky stems, so you will still need to inspect the kale carefully and ensure that all stem bits are out. So, is this salad worth the fuss? Perhaps the best way to determine is to try it once and see what you think. I recommend serving it warm, just a bit above the body temperature, but cold works too! De-stem kale with care, and chop roughly. Place a large frying or sauté pan over a medium heat and add the olive oil. Next, add the sliced garlic and let it sauté for just a minute. Add the kale and mix well to incorporate all the garlic. Let the kale sauté for 8-10 minutes. The kale should be fully cooked! Add balsamic vinegar, mix well and keep the heat on for 1-2 more minutes. Turn the heat off, add the chickpeas, and salt and pepper (if using) and mix well. Transfer the salad into a serving dish, and let it stand until just warm. The leftovers will store well in the fridge for 2-3 days, and you can enjoy this salad without reheating. Makes a great stuffing for a pita bread sandwich! Plus: unlike dealing with meat, especially poultry, all the ingredients in these meatballs are safe to eat as is, which means that even young kids can get involved and roll some meatballs. I told you – these can be fun for everyone! What makes these meatballs Asian is the combination of scallions (green onions), Sriracha (hot red chili sauce), fresh ginger, panko (Japanese breadcrumbs), and peanut butter that get mixed with chopped, not ground, soya chunks. The idea is to retain some of the soya chunks structure rather than grind them to the consistency of ground beef. Think chicken salad, rather than taco meat. To complete the meal you will need to do some spiralizing, which is one of my favorite things to do with zucchini, summer squash, and even potatoes. Here, I combined carrots and zucchini which gives the salad a nice contrast of crunch versus softness, plus a colorful appearance. The spiralized vegetables are mixed with some slivered almonds, lime juice and zest, and tossed to combine. Top them with a meatball or three, and you got yourself a dinner! Prepare soya chunks according to the instructions on the box. They usually need about 3-5 minutes in a pot of boiling water. Drain and rinse your soya chunks under some cold water, then chop or grind them into small chunks, similar to chicken chunks commonly used in Asian Dumplings recipes. Place them in a large bowl, and add all the rest of the ingredients. Mix everything well and let stand for 5-10 minutes before making the meatballs. Heat a large skillet or a cast iron pan over the medium high heat. Spray with some cooking spray and brown the meatballs on all sides until golden brown. Brown the meatballs in batches and make sure you don’t overcrowd the pan. While the meatballs are browning, prepare the salad. You can either buy a box of spiralized carrots and spiralized zucchini and toss them with some lime juice, lime zest, and toasted slivered almonds, or you can spiralize your own if you have the spiralizer. Let the salad rest while the meatballs finish browning. To plate, place a good amount of salad in the middle of the plate, and top with 2-3 meatballs. Enjoy! For me, pasta salad is a conceptually hard thing to swallow since I equate salads with (mostly) green leafy vegetables. Growing up, there was a clear separation between salads and pastas in my mother’s cooking and our family meals. But, after living in US for almost two decades, I’ve come around and appreciate that pasta salads have a place on my plate, especially if I am holding that plate during a large summer cookout or a potluck. Having said that, I still think that many pasta salads leave a lot to be desired as they tend to be overloaded with mayonnaise, meat or even cheese. So, I decided to develop a pasta salad recipe that is simple and light, yet full of flavors and surprising textures. The recipe below really blew me away! It’s super simple, uses only six ingredients, it takes less than twenty minutes to make, and it is a perfect pasta salad for big get togethers because it is super inexpensive. The recipe is very simple and self-explanatory. Few tips here are: don’t cook your pasta for too long, drain it well but don’t rinse; mix the pasta with the rest of ingredients while it’s still hot, and then let it cool while the flavors are developing and merging; and if using kalamata olives in oil, scale back on the amount of olive oil you actually add – otherwise you’ll end up with something that’s too oily, which will be too bad! And speaking of olives – kalamata olives that I get come with a nice level of acidity so I don’t feel like I need to use extra vinegar when I’m using them. This means that my recipe below does not include vinegar. 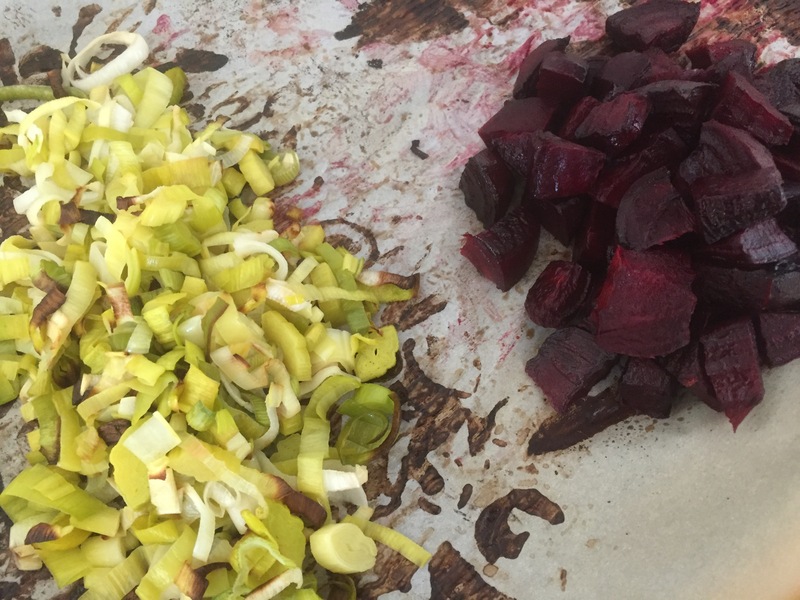 Now, if you like a bit more tang, feel free to add some lemon juice or a dash of red wine vinegar to adjust the acidity level in this salad to your personal taste. Finally, if you don’t have a box of penne rigate on hand, don’t worry. You can use any spoon friendly pasta for this – meaning not long pasta. Why do I recommend NOT using long pasta? Well, if you are thinking of this salad as picnic, pot luck, sharing-with-friends-and-family friendly, then help your friends and family help themselves by not having to wrestle with long pasta. I also think that tubular pastas work better for this recipe than flat ones – think penne, ditalini, macaroni as better, and farfalle as perhaps less suitable for this recipe – as tubular pastas have a bit more surface area to absorb the subtle flavors. And among the tubular pastas, those with ridges will work just slightly better because of the same surface area availability principle I mentioned. Having said all this, and having dragged you through likely totally unnecessary details on how to choose just the right pasta for this recipe, I’d like to stress again – just grab a box of pasta you have on hand and it will be just fine! Cook the pasta following the instructions on the box. Don’t overcook it – the pasta will be ready when it is slightly chewy to the bite. While pasta is cooking, chop the olives and the fresh basil leaves. Put to the side. Drain the pasta well and place in a large mixing bowl. Add oil, chopped kalamata olives, garlic powder, and mix well. Toast the almonds in a toaster oven or on the stove top in a heavy skillet. Watch the almonds constantly as they do burn quickly. Add the toasted almonds to the rest of the pasta salad, mix well and leave for an hour or so. Add fresh basil just before serving, toss everything together and enjoy. 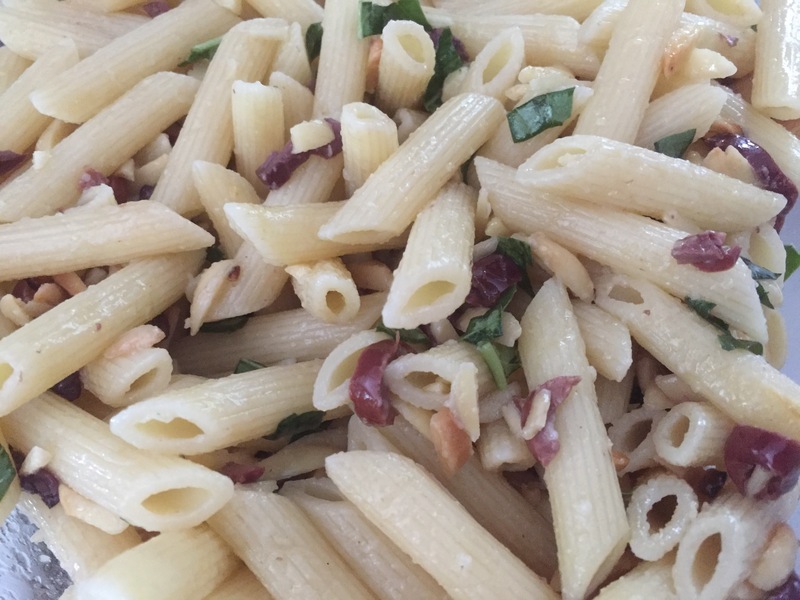 The result is fragrant, complex in flavors and textures, yet simple and cheap to make, perfect summer pasta salad.